A job as a “med-rep” ties both medicine and sales together. As a medical sales representative, what you will be doing is to sell your company’s line of prescription drugs and medical equipment to health care professionals or health care facilities. No academic requirement is often needed to become a medical sales representative, for as long as you have the drive and the enthusiasm to perform a marketing job in the field of medicine. If you do, start drafting your application with the help of these Sample Resumes. 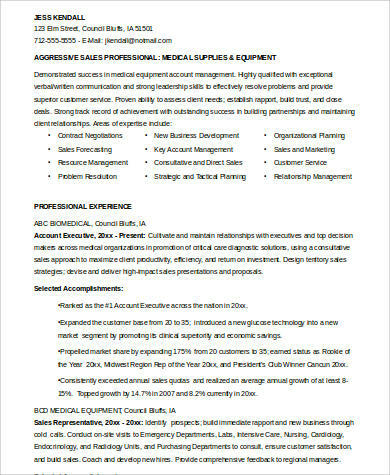 Medical sales representatives work for pharmaceutical labs and for companies that manufacture various medical equipment. life sciences, and other such programs. Degrees in sales, business, or marketing are also bonuses, most especially when supplemented with experience in medical sales. 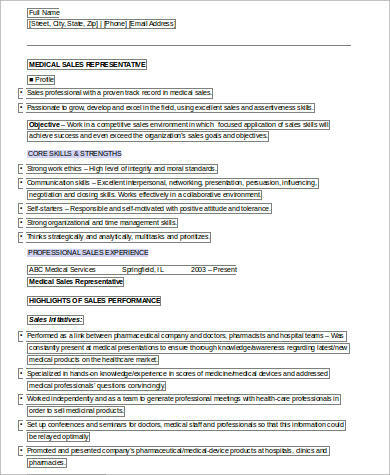 Contain and present all these through the most effective resume format. 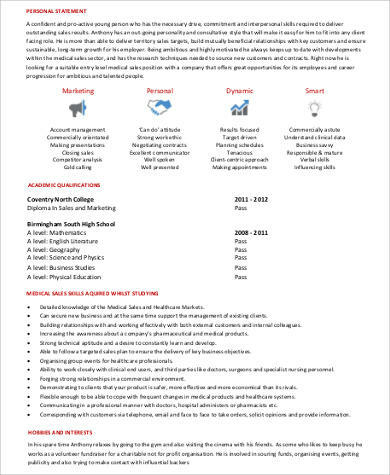 the hybrid or combination resume, which combines both elements of the above two. 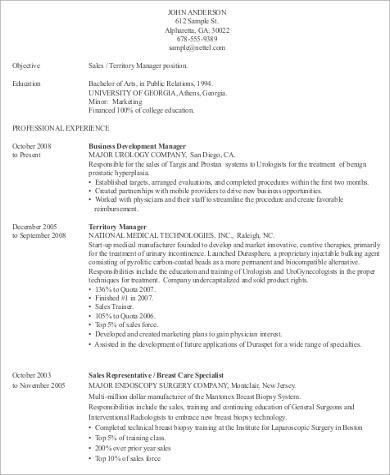 As an aspiring medical sales representative, consider using this. 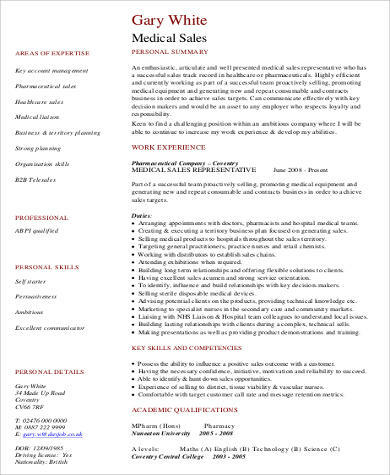 It should demonstrate your qualifying skills, and should present a list of your work history and experiences on either sales, medicine, or both. A medical receptionist performs clerical roles at hospitals, clinics, and other health care facilities. By contrast, the work of a med-rep is far from stationary as they go to customer after customer, and as they carry out all these presentations, pitches, and even conferences. 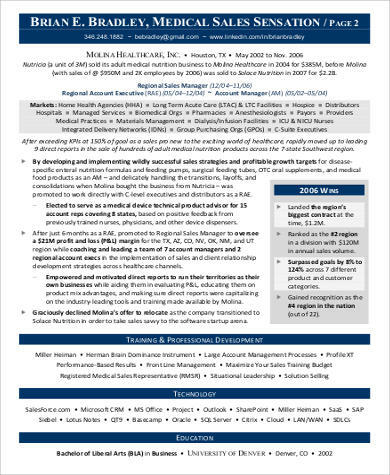 If anything, medical receptionists receive and schedule health care professionals’ appointments with med-reps. For more on what they do, see these Medical Receptionist Resumes. Like medical receptionists, medical assistants perform administrative and clerical roles too at health care facilities, and are stationed herein, as opposed to med-reps that are mobile and are always on the go. 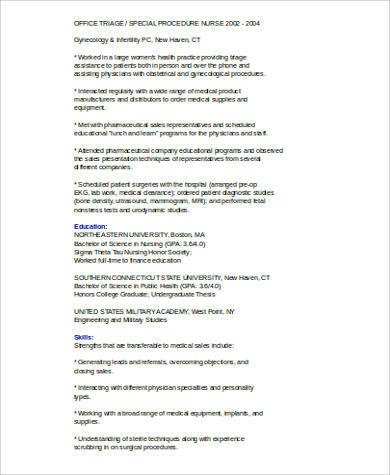 If interested in working as a medical assistant, see these Cover Letters for Medical Assistant.